This week at Home Mender we want to shed light on an aspect of your home that no one can ignore: interior and exterior lighting improvements. Lighting doesn’t just have to be limited to providing the light we need, it can be a stable in your home. 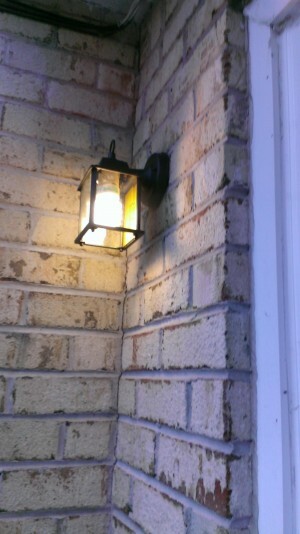 Lighting inside and outside your house help set the mood and atmosphere. By focusing on what each room needs you can make simple changes to your lighting that will improve your entire house. A good place to start when improving the lighting of your home is to get rid of the harsh fluorescent lighting usually found in kitchens and bathrooms. While fluorescent light bulbs are energy-saving, they offer harsh light that is hard on the eyes and rarely complimentary when used in the bathroom. There is an even more energy-efficient choice: LED bulbs, or light-emitting diode. Many times the bulbs are encased in a diffuser that softens the light, and some are available with a dimmer feature. LED are the solution when it comes to energy-efficient lighting in your home. The most common bulb for home lighting applications are warm white and cool white. Cool white is closer to natural sunlight, which is best for task lighting while warm white is slightly yellow and better for ambient light. Either way, they come in a wide variety of styles, perfect for interior or exterior lighting. Now that we know how to improve the actual lighting of your home, let’s talk design ideas. LEDs are available in traditional fixtures, candle bulbs for chandeliers, spot lights, flood lights, light strips or ribbon lights and more. LEDs also cast a wide-angle beam which means they are perfect for a driveway, patio, pool area, or deck. The key to lighting any room is planning. Know the function of each room and how you want it to be of use for your family. Proper layering enhances color and ambiance. Layering involves the use of task, accent, and ambient within each room. For example, the kitchen calls for a more complex lighting plan because more happens in this room than any other. Plan overhead lighting for heavy-duty tasks, incorporate task lights such as pendants over the island or bar, and add accent lights to show off special design features. Each room is unique and requires different lighting needs according to what you want. The same applies to the exterior of your home. There are many design options for decks, patios, and walkways. With LED bulbs the options for lighting that is both energy efficient and soft are endless for both interior and exterior lights. Home Mender is dedicated to making your house a home through simple tips and tricks that are easy for everyone. And as always, Home Mender Inc. is here to put a smile on your place for more complicated improvements or maintenance.